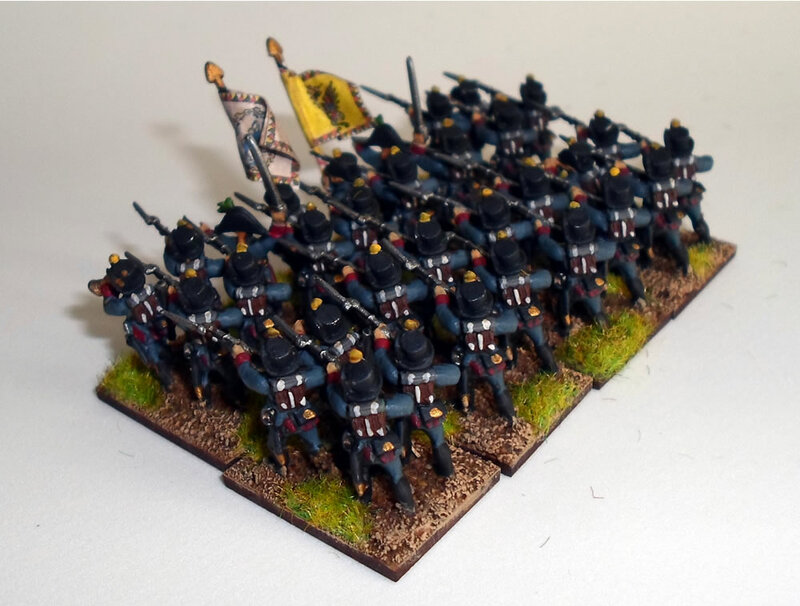 As I warm up for starting the Bavarians, well, whilst I waited for them to arrive actually, I pulled out one of my remaining Austrian Units to get my eye in. The Viennese Volunteers - Freiwillinger Battalions - served at Aspern-Essling as part of the advance guard of 6th Corps. My Austrian infantry regiments are 32 models in size, representing two theoretical Battalions of 16. 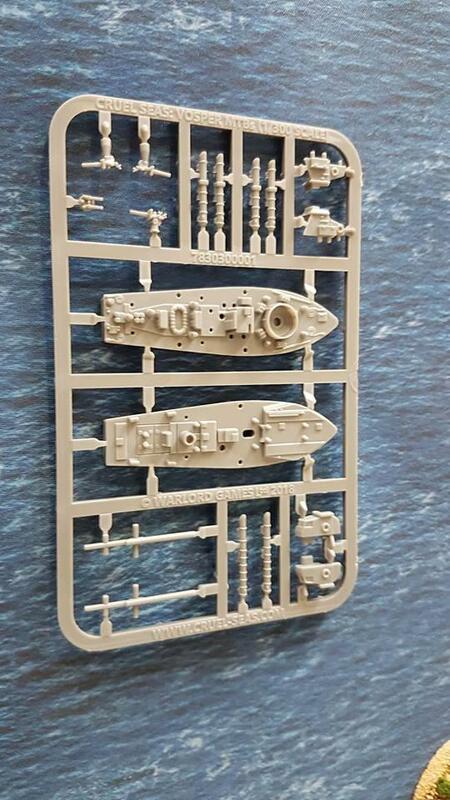 At the same scale Bavarian or French regiments will be 24 models strong. A fine size for a unit, though it wouldn't break down well into subunits. Nevertheless, my Bavarians will nominally be in 24 man units to face 32 man Austrians units - the Black Powder rules will accommodate this simply by giving Austrian units more stamina, possible more melee ability too. 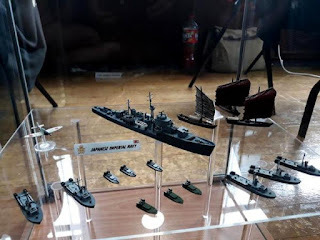 Well, my models were anyway. T'was the turn of the century, and I was not far off moving away from the ancestral home to parts new. 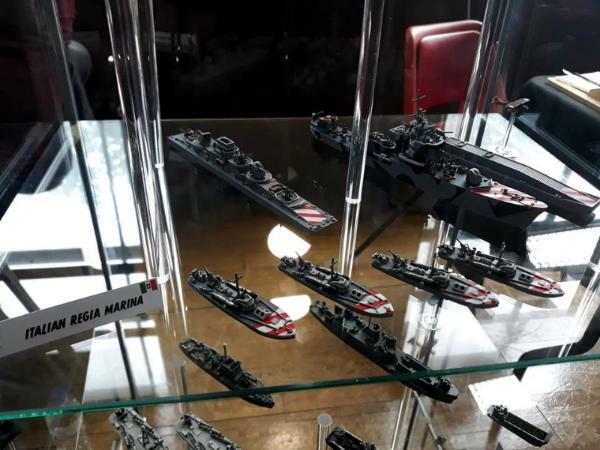 In my last year as a member of the Grimsby Wargames Society however, we were heavily involved with AK47, and produced a well received display game. My contribution here being the Green Vickers tanks, Blue Police vehicles and men, concerned citizens and all the buildings. Martin Buck provided the UN supply line and civilian trucks, whilst the terrain boards were club standards for the most part. 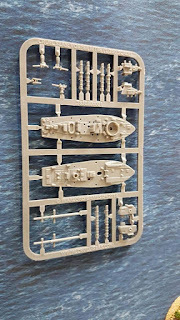 Inside the article had more shots, including the airport and railway the layout had, and the patrol frigate out in the dock that was written into the game! 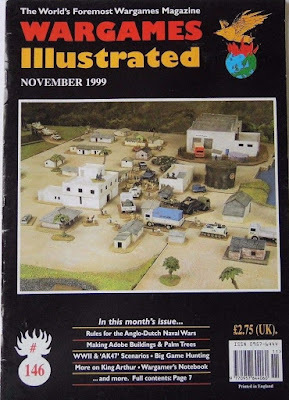 I would say this represented the high-watermark of my Wargaming profile, but I guess blogging has kept me ticking over since, at the end of the day I have neither the research discipline or enthusiasm to write for the magazines; WI is a very different beast now to what it was then anyway. I don't think I've more than flicked through a copy in three or four years. Well, I wasn't aware of this. This is due out in time for Xmas as a starter set, retailing for £50. It'll contain the rules (obviously) and 10 motor torpedo boats - 6 British, 4 German. It shalt be a 'Medieval' world, full of western imagery, weapons and Armour, likewise tactics shall not have evolved beyond "Charge!". Thou shalt have Humans and they wilt be Heroic. There will be Orcs and Goblins, even if by another name. Similarly will it be for Elves and Dwarves. Each will serve as proxies for personality traits that Humans being Heroic does not permit them (Orcs evil, Elves aloof, Dwarves stoic, and so on). New races never seen before shalt not be permitted. Humans shalt ride horses, and nothing else, everyone else gets one mount to suit their race and nothing else, it shalt not match one already taken. Anything that seems like modern technology shalt actually be so ancient that it is handed down through the generations gaining mystical provenance. Wackiness and fun shalt not be permitted, everything shall be sober and preferably 'Grimdark'. Everything will be reduced to a Faction, because nations and cultures are complex concepts for adolescents to get behind, videogame concepts are not. Conversely world history shalt appear to go back millenia, without anything ever fundamentally changing. Empires last indefinitely and yet wilt always be on the brink of collapse. Religions will divide into the 'Pseudo-Christian' or 'Barbaric-Pagan', regardless all will have a remarkably uniform underworld population of demons. Whilst this is intended to be tongue in cheek, it is remarkable how many of these hold true for every half-successful game release. It is to GW's credit that they try to break some of these rules, but they also fall down hard on others. Given the sheer variety that Fantasy supposedly permits, why is this template so prevalent - mainstream? Is it down just to the ease of procuring items in these predictable themes, or does it speak more of the audience in the first place? 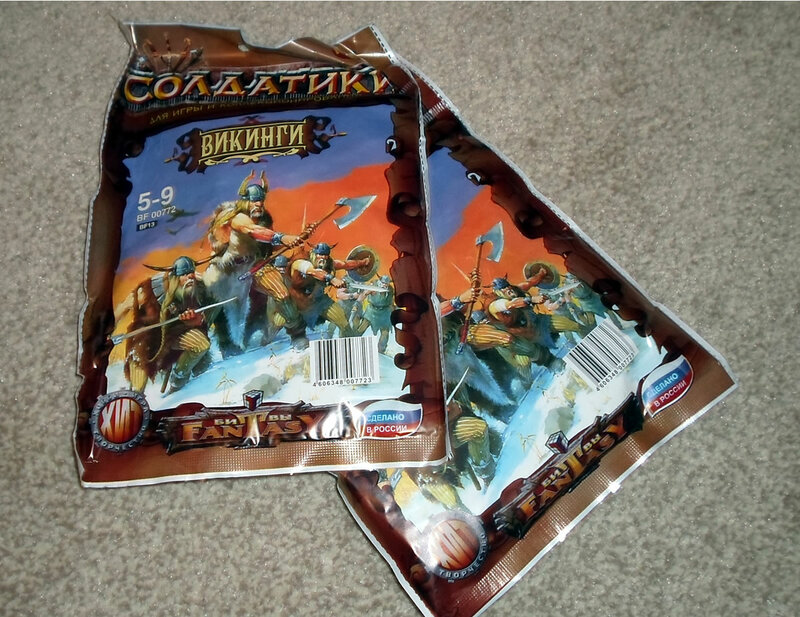 For myself, I have two new Fantasy armies for Dragon Rampant planned, which both hope to avoid as many of these cliches as possible. I know, more projects! 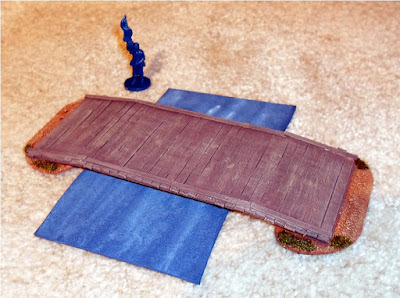 So the Mantic Terrain Crate continues to provide, but there are also things it didn't contain that I realised I didn't have, so I expediently fashioned a solution. Firstly a couple of 28mm scale hedges from the Terrain Crate. In some ways these are the least realistic items in the Mantic terrain set, yet they are not half bad and painted up really nicely, quickly too. 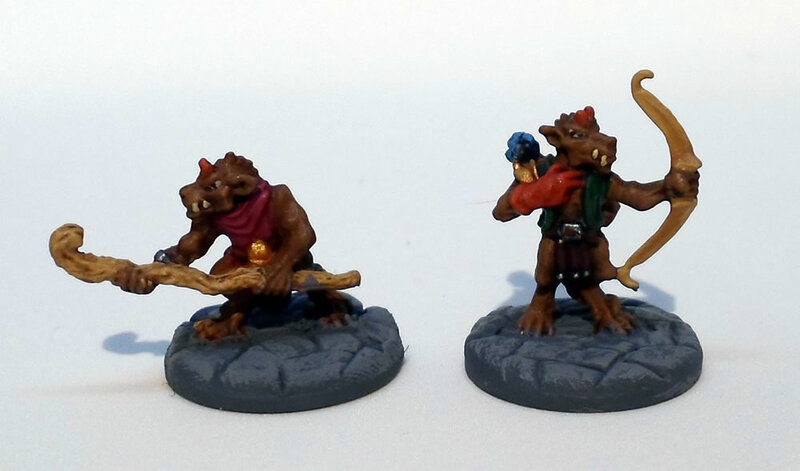 It didn't seem worth basing them beyond what they already had, though I may go back and add some static grass. As noted the set didn't contain some items, foremost a bridge. I've just done a 15mm bridge, but didn't have a 28mm one. However scraps from the bits box solved that problem, and the bridge below is a combination of a strip of MDF, twenty coffee stirrers, two beermats and an IKEA pencil. This was a super quick, cheap and easy project, but I'm really pleased with the colour of the woodwork. This will work for most periods in a rural setting across Europe and North America at least. The terrain collection is really coming along. 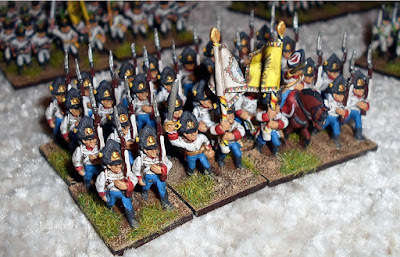 This provides another light infantry unit to bolster the force. 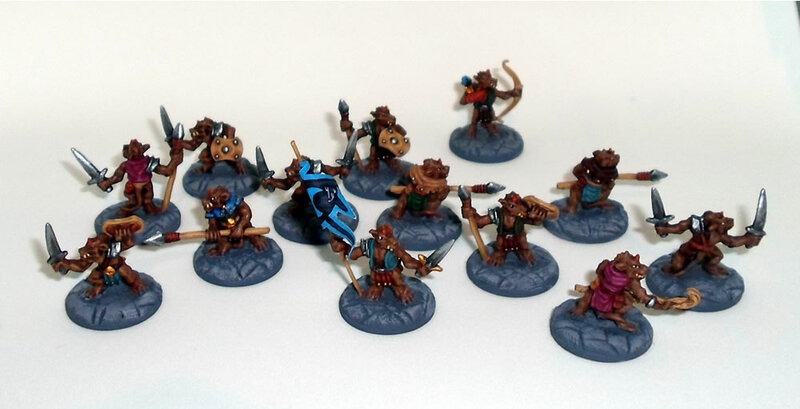 It sees all of the initial collection painted now, including the handful of metal character models. 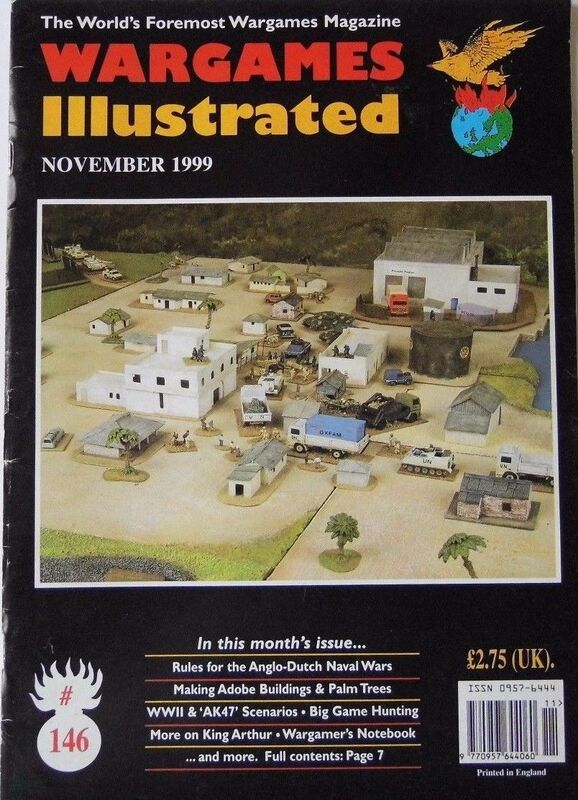 Back to historical models next I think. I'm a big fan of creating fantasy armies from unlikely items; plenty of evidence for that in the past on the blog. it's one of the reasons I end up with so many fantasy armies, I keep getting inspiration for turning lemons into lemonade. An army of 5 giants cost me a fiver. However in the case of this particular army, they are a bit one dimensional, and lack variety, being 5 big blokes who hit things. 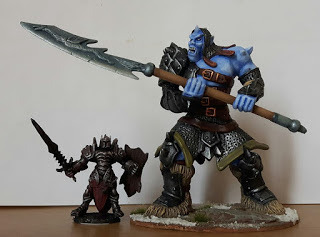 close to a year ago I picked up some models to thematically add to them and improve variety. 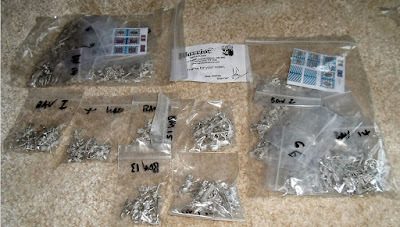 Which got me a total of ten models, so at a pound each they aren't bad value. They are also a decent size, as stated, around 2 inches tall; the equivalent of a ten foot tall humanoid against most 28-35mm miniatures. I had good fun with this light blue skin tone, but these actually took quite a lot of painting; for toys they have a heck of a lot of detail. I have enough for two more units of Heavy foot or similar again with three models as a unit. The idea being that these are the Asgardians, Nordic warrior heroes, who ascended to the heavenly land of the Giants to indulge in unending war. They are Giants among men, and but few of them will rise to the greatness of becoming a true giant. Or something. In real terms these models add some ranged fire to my Giant army, something it had to rather improvise up until now. Additionally I have ideas/plans for three more DR forces in development. Too Many Projects indeed! Two recent reads of interest to the blog audience I think. Firstly Charles Esdailes' exhaustive examination of the Peninsular War. I say examination rather than account or story, as from a pure military history buffs viewpoint, Esdaile is rather skimping on the battles themselves. Despite some 600 pages relatively few engagements are covered in more than a couple of pages, this rather is a book of grand strategy, politics, economics, social upheaval and bureaucracy. Not that this should be seen as a criticism. If you want to read about the battles in Spain, or the specific organisation of units, hence ye to an Osprey book! 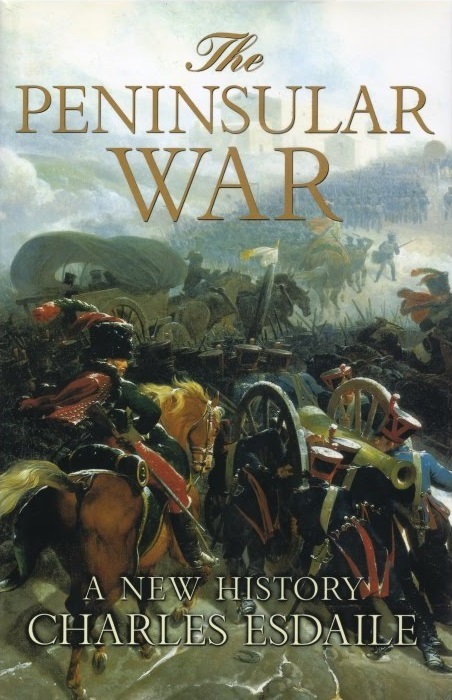 Rather this examines the context of the war with thorough, somewhat academic, reviews of the plans of all sides, their grand execution and impacts. Whole chapters are devoted to the politics of the Spanish Junta, a prolonged debate on the purpose and effectiveness of Guerrilla's, and life in Josephian Madrid. This is an invaluable read for those interested in the War in detail, but not a particularly engrossing one. It took me many months to finish largely due to only being able to manage 5 or 6 pages at a time. It's a dense, academic book, that at times manages to rise to the dizzying heights of being enthralling. At times, but not all times. This is a book I was put on to by a Youtuber, having never heard of it before. It is quite the discovery. From the City, From the Plough, is fiction, but only just. Author Alexander Baron leans heavily on his own experience and observations during the war to write what becomes a powerful account of the British experience in Normandy. No slice of Daring Do this, and few cliches either, in a book that avoids the obvious and sentiment in an effort to really hit home with the brutal conclusion. 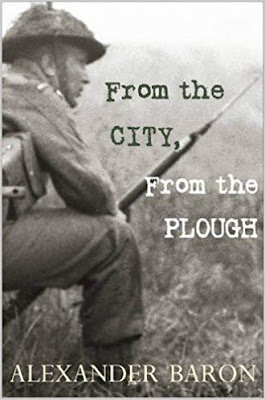 Baron writes with an easy, poetic style, that in the first half of the book covers the training and waiting for action of an infantry regiment in the south of England, vignettes of army life are plentiful, alongside character sketches and insights on daily life. So far it feels very safe, cosy at times, and terribly, terribly, British. Characters help local farmers, after drill, court girls at the local dances, sneak off to London to gamble. Their Colonel and Major worry about them, they fight, and fall in love. Then the regiment goes to war and nothing is ever the same. The final eighty pages of this short tome are utterly brutal, whilst holding a macabre beauty all their own. The unit finds itself at the lead of an attack so well and clearly drawn from real life, that veterans of the battle were able to identify it and whom some of the characters in it were. Before that there are yet more scenes, simply, poetically and more importantly, accurately drawn that do more than many better known works to epitomise the experience of battle. Heroes are few, but cowards are fewer, it becomes rather a tale of the soldiers experience. And how the choice to carry on is simply not there. It is, incredibly affecting. I cannot recommend it highly enough. TML - Too Many Projects perhaps? I have a neat little Austrian 15mm army, it doesn't see a lot of action however; as it has no opponents. A common complaint, many wargamers build armies then find an absence of an army for them to fight; not an issue in fantasy games generally, so long as you are flexible over rules or stick to a major game system, and not much of an issue if you throw historical accuracy out of the window. The latter is tolerable for Ancients through to the middle ages, to a point, but I'm not going to field a carefully researched Napoleonic Austrian army against someone's American Civil War Union army, or blooming Zulu's, just as they come from the same century; am I? One battle with the models is just not enough, so I guess I'll have to make the tough choice. Hah, you may have thought I would sell them. 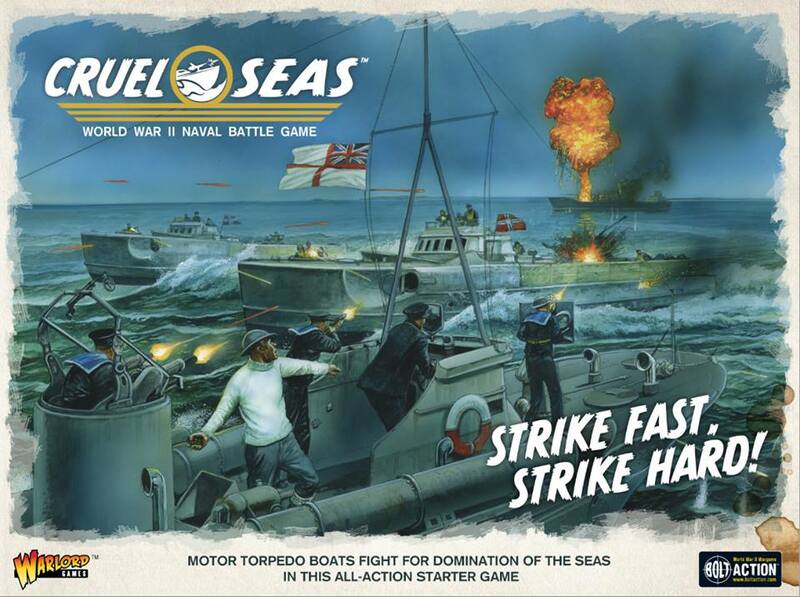 No way, they are far too nice, and moreover, permit the prospect of good sized games at home in TML towers modest gaming space (room for a 6x4 foot at a pinch), and games out and about without a hernia from shifting crates of miniatures. But they still need an opponent, one I can place in the hands of willing commanders without the need for them to supply their own minions. I've always preferred to provide both sides anyway, it just makes life easier; opponents can be fleeting and transient, and if they take their armies with them you can be left with a lot of underemployed bods in boxes, preying at the mind suggesting a retirement to eBay as more worthwhile than the prospect of eternal damnation on a dusty shelf. 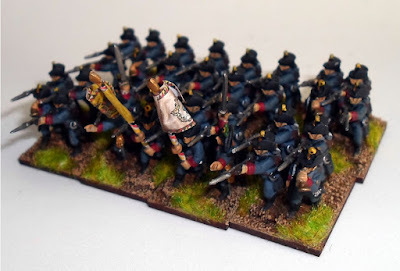 TLDR: I bought a new army. 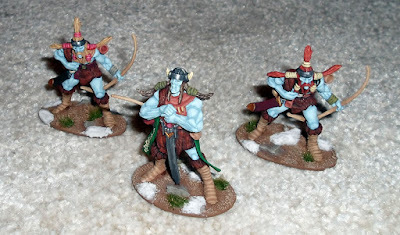 Good old Warrior Miniatures will provide an ideal challenger to my established force. 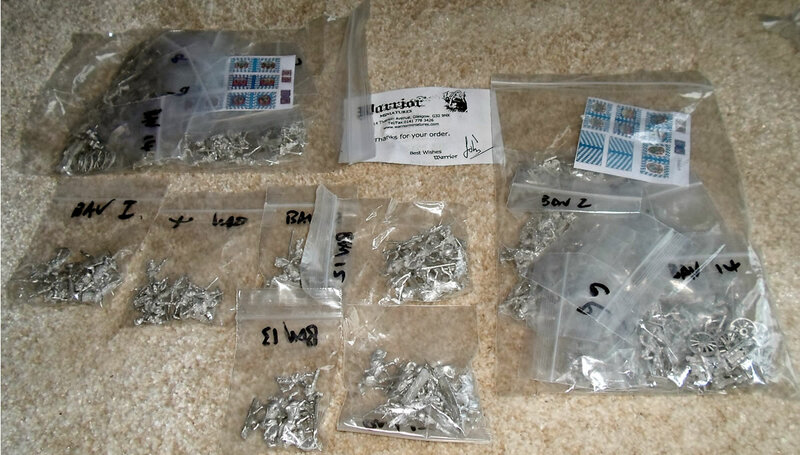 After much pondering I opted for two starter armies of Bavarians, and some additional packs to fill out units, for the princely sum of £50 with postage! 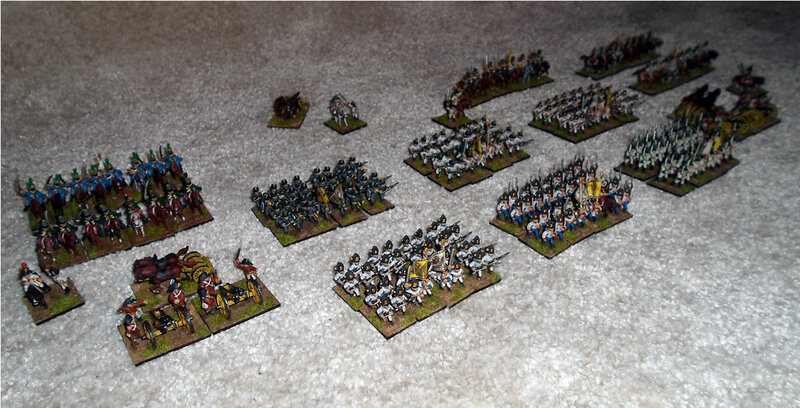 This is enough to scratch together 6 regiments of foot, 4 of horse, and 4 batteries of artillery with 2 guns each. 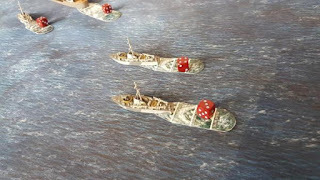 Now the reason for the extra 15mm terrain should become clear. It could take a few months to get these to the table (to say the least) but at least they should eventually provide an appropriate force to face an Austrian invasion.